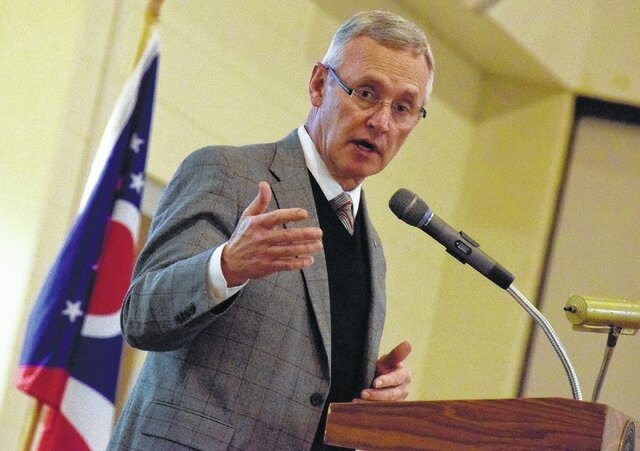 PODCAST: Listen to Jim Tressel’s entire keynote address. RIO GRANDE — Life, according to Jim Tressel, is all about people. Tressel was the keynote speaker during the 79th Gallia County Chamber of Commerce Annual Meeting and Awards Banquet. Tressel became the ninth president of YSU on July 1, 2014, after serving as vice president for student success at the University of Akron. Prior to his stint at Akron, he was the head football coach at Ohio State University (2001-10), where his teams won the national championship in 2002, in addition to seven Big Ten titles and eight BCS bowl games. As head football coach at YSU from 1986 to 2000, Tressel’s teams won four Division I-AA national titles. “One thing we used to tell our teams, from the time we were at Youngstown State to Ohio State, is that you need to start every day with an attitude of gratitude,” he said. “Sure we have hardships. There are hardships everywhere. But when you start comparing your list of blessings to your list of hardships, we’re certainly fortunate here in this country. We’re certainly fortunate here in this state. Tressel said there will be times when life doesn’t go as planned. Tressel said people’s lives are busy and have become even more so with technology, but that it hasn’t hampered Americans’ – particularly Ohioans’ – work ethic. Before one can answer that, Tressel said four “boxes” must be checked, the first of which is relationships with other people. The second “box,” according to Tressel, is feeling valued and having autonomy. “The only way we can become the best we can possibly be is to feel valued, be thinking about solutions and all be in it together,” he said. Next, Tressel said feeling good about one’s self is an important box to check to answer the question about one’s purpose in life. The last box, according to Tressel, is maintaining perspective. Tressel said evaluating one’s self is a constant process. Tressel closed his talk with words from a poem penned by Edward Everett Hale that he said sums up what people can do for the collective whole. “I am only one, but I am one. I can’t do everything, but I can do something. And that I can do, I ought to do. And what I ought to do, by the grace of God, I shall do. Youngstown State University President Jim Tressel delivers the keynote address Thursday night during the 79th Gallia County Chamber of Commerce Annual Meeting and Awards Banquet. Tressel is best known in Ohio as the former head football coach at Ohio State University.